» Office Tenants Plagued by Series of Illegal Supergraphic Signs; Do the L.A. City Attorney and District Councilman Care? Office Tenants Plagued by Series of Illegal Supergraphic Signs; Do the L.A. City Attorney and District Councilman Care? Andrea Bari across the street from his second floor office windows covered by the supergraphic sign advertising HTC cellphones. It is the third illegal sign put up on the building this year. Last March, we reported on the case of an illegal supergraphic sign advertising Chase Bank installed over the second-floor office windows of a building at 7201 Melrose Ave. The city issued a citation to the building owner, Macculloch Properties of Brentwood, and in May referred that citation to the City Attorney’s office for criminal prosecution. The sign was then removed, but replaced in August by one advertising the TV show, Melrose Place. 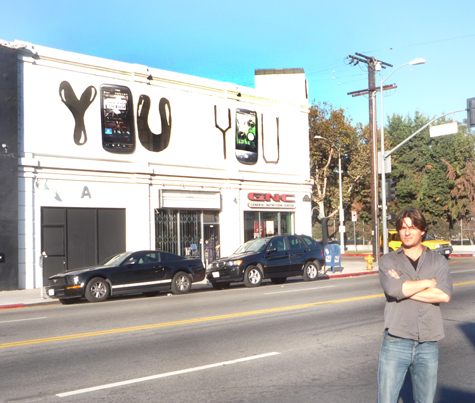 Then in October, a third supergraphic sign went up, this one advertising HTC cellphones. As of this writing, the sign was still in place. On Nov. 2, we submitted a formal request to the City Attorney’s office for details of the status of the case referred by the Department of Building and Safety five months earlier. The office has acknowledged receiving the request, but to date hasn’t disclosed any information. One of the tenants of an office behind the supergraphic sign is a music composition business named Link Music. One of the owners of the business, Andrea Bari, said he was contacted by the building department after the Chase Bank sign went up, but hasn’t hasn’t been contacted further by any inspectors. Bari said that in addition to the signs blocking light and ventilation from the offices’ openable windows, he was told by an inspector that the sign could constitute a fire hazard. Early last month, Bari also contacted Councilman Paul Koretz and City Attorney Carmen Trutanich to ask why the city could not force the removal of any of the illegal signs. Bari said Koretz’s office acknowledged receipt of his inquiry, but hasn’t contacted him further. He received no acknowledgement of the e-mail inquiry to Trutanich, he said. Unlike some office buildings draped with supergraphic signs, there is no court injunction prohibiting enforcement against signs at the Melrose Ave. building. The Chase Bank sign put up last spring came well after passage of a moratorium on any new off-site signs approved by the City Council in December, 2008. The Melrose Place and HTC signs were put up after the council adopted a permanent ban on off-site and supergraphic signs on Aug. 7 of this year.